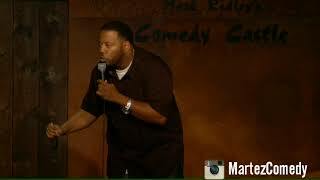 Martez has toured across the country performing at comedy clubs and colleges. Comedy clubs include the Improv in Miami and West Palm Beach, Florida, Mark Ridley’s Comedy Castle and Caroline’s in New York just to name a few. Martez has also been named one of Robert Townsend’s Partners in Crime, “The Next Generation,” which is Robert Townsend’s latest addition to the classic Partners in Crime. The DVD can be purchased at www.amazon.com . Martez has also performed, competed in and been a finalist in many comedy competitions and festivals, such as The NC Comedy Arts Festival, The Funniest Comic in Cleveland, The Bay Area Comedy Competition, and Comics on Fire just to name a few.